The threat of a Foreign Animal Disease (FAD) emerging in the United States ranks high on the top-10 list of concerns for any zoological facility. FADs could have huge trade implications for our nation's food-producing animals, and, from a clinical perspective, it is unknown how these diseases could affect wildlife in our collections. However, the potential actions taken by state and federal regulatory agencies to control an outbreak could be an even greater concern. The ZAAHP Fusion Center is a new program, currently funded by the United States Department of Agriculture Animal Care and based at the Association of Zoos and Aquariums in Silver Spring, MD. The ZAAHP—which stands for Zoo and Aquarium All-Hazards Preparedness (Response and Recovery)—Fusion Center has already been working closely with federal and state partners to connect the zoological community with subject-matter experts, at a time when highly pathogenic avian influenza (HPAI) strains have emerged in North America. It is important to note that the ZAAHP Fusion Center was created to benefit the entire managed-wildlife community, whether or not a facility is aligned with a recognized association. The Fusion Center is designed to serve as a conduit for information about FADs and any other hazards that may affect the managed-wildlife community. The Fusion Center is creating a contact database so it can send out email blasts to the entire group or provide direct information on a regional level. In addition to regular updates, the database has been used to invite exhibitors to two ZAAHP Chats scheduled with HPAI experts, to help provide the managed-wildlife community with the most accurate information available. FAD issues are not the only areas of concern for the ZAAHP Fusion Center. It is also working closely with the National Alliance of State Animal and Agricultural Emergency Programs (NASAAEP) and the National Animal Sheltering and Rescue Coalition (NARSC). This collaboration supports ZAAHP's mission of all-hazards preparedness. The Fusion Center is working on additional projects that will benefit the community, including the Secure Zoo program. Currently in development, Secure Zoo is based upon successful agricultural industry programs, including Secure Milk and Secure Pork. These Secure Food Supply programs were designed to assist with business continuity and recovery, in the event of an FAD. 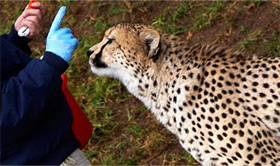 At the heart of the Secure Zoo project will be guidance for state veterinarians to use when they consider the feasibility of a facility maintaining visitation and how it will recover if affected by an FAD. Many facilities rely on visitation to keep their doors open, and it is critical that state veterinarians understand this. If facilities can demonstrate their ability to increase biosecurity and protect collections, staff, visitors, wildlife, and agricultural species, the managed-wildlife community should be able to successfully make that case. The ZAAHP Fusion Center is gradually expanding its circle of contacts and invites you to learn more about its projects. If you have questions about the Fusion Center and its projects, or want to get your facility signed up for ZAAHP email updates, contact the program manager, Dr. Yvonne Nadler, at dr.yvonne.nadler@gmail.com; the program specialist, Ashley Zielinski, at azielinski@aza.org; or the program supervisor, Steve Olson, at Solson@aza.org. San Diego Zoo Global Academy offers an online course on Disaster Preparedness. This course will help you become better prepared for an emergency situation, including the most common catastrophes: fires and floods. 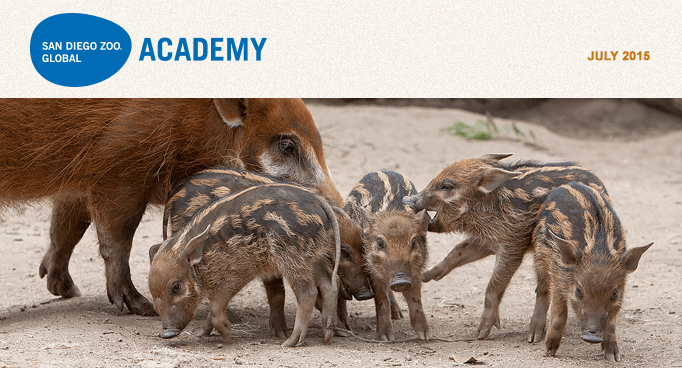 Many of your animal care employees may be taking the course as they pursue a certificate in the Academy's Fundamentals series for Animal Care Training. This two-hour course may also provide ideal specific training for members of your team. Thank you for reading this right NOW. The fact that you receive this column in the San Diego Zoo Global Academy's enewsletter speaks volumes about you and your zoological organization. It means a lot to me, as well, because these words and your actions connect us as collaborators, of sorts, in the service of animals and their well-being. That's good. It's also a fun part of proactively working with zoological professionals in creating a brighter future for animals. By looking at and reflecting upon these words—quite possibly in conjunction with Academy coursework, as part of your ongoing professional development and commitment to excellence—you understand that what you do today matters. Taking or investing time in bettering yourself, both personally and professionally, and then improving upon the effectiveness of your zoological work, you are bound to make an even bigger difference for animals. Today, you gain one new idea or think somewhat differently about an animal-care practice or environmental feature, and that stirs action on that idea or toward evaluating and improving other things. Perhaps that leads to one or more tiny innovations—slight modifications in the way you work together with your colleagues, or variations in enrichment measures. Ultimately, animals benefit. The good that emanates from your one idea may seem nice but rather insignificant, especially in light of all the good you wish to contribute. The most important thing to understand is that today, one thought, one action, one change, or one collaboration improved at least one animal's life. Using your time now—today—to consciously make yourself and your work more impactful, in terms of enhancing animal welfare, is a tremendous and thoughtful investment. Some days, your conscious efforts may generate greater positive change. Maybe one day, each week or so, you and your colleagues (whatever your department, position, or function) brainstorm together, asking each other what is the simplest thing you might do now to enhance the well-being of one animal. Start there today, or one day soon, and as your compassion for animals fires you up with ideas, you will be amazed at what you have done now—and how much greater the impact will be over time, as you find one simple thing to improve every day. That impact will be significant for that animal, today and every day. You will be forever grateful to yourself for having put your heart and soul into at least one good measure today. The results each week, month, quarter, and year will astound you (and greatly benefit animals) when you make certain today matters. Today matters. Make your day—today—count. What can we do TODAY to improve the well-being of animals? Please email James at jfg@excellencebeyondcompliance.com to share the good you are doing (as only you can), or with any comments or questions on this column or suggestions for future ones. For more information on EXCELLENCE BEYOND COMPLIANCE® click here, to order the ebook, click here. For upcoming workshops and sessions, click here. Register at info@excellencebeyondcompliance.com. We have a five-foot Amazon tank at home to look after, and now I have four more tanks. I get calls at odd times, saying "my fish is sick," and I have to rush around and do water changes. It's the last thing I need to hear when I'm about to fly interstate or overseas, and the stress it causes on the family for one of these tanks with two fish in it is nearly as bad as a large tank at a public aquarium! Of course, I exaggerate, but hence my point. The key concept is that multiple factors are often involved in the outbreak of disease in fish. 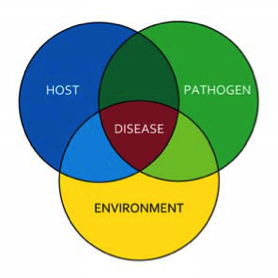 Where the three circles overlap is the area leading to the development of disease. The same dynamics apply whether we are looking at an individual fish or a population of fish. It is important to always explore all potential contributing factors. Due to the interplay between factors that contribute to disease, it is even possible to have a pathogen present but not experience a disease outbreak, because other environmental factors are not present—such as poor water quality. We will go through the first two circles in detail, and see how you can affect them. We will examine environment—the main area you have control over—next month. "Host" refers to your fish or aquatic invertebrates. The genetic makeup of the fish you have cannot be altered. However, the food they are given will have a major impact on their immune system. Fish have an immune system that is remarkably similar to ours, and the saying "you are what you eat" applies to fish as much as it does to us. So, providing the best quality food for your fish—either flake, granules, fresh, or frozen—is essential. Often, I see situations where a lot of money is spent on displays, life-support systems, and fish, but the cheapest food possible has been provided. Always look for a commercial food that is fortified with vitamins and minerals, especially Vitamin C, since this has been proven to be an excellent immune stimulant in fish. If you are feeding fresh or frozen, adding a vitamin supplement is essential. Pathogens are the bad bugs—viruses, bacteria, protozoans, monogeneans (flukes), and other worms—that contribute to disease or cause disease to occur. The best way to manage this is to acquire fish from a reputable supplier and isolate the fish in a quarantine tank for at least 30 days before adding them to an established tank. Keeping the pathogens out in the first place is much easier than adding treatments later. Quarantine and biosecurity will be covered in future columns. Reference: Snieszko SF 1974, The effects of environmental stress on outbreaks of infectious diseases of fishes, J Fish Biol. 6, 197-208. The San Diego Zoo Global Academy Puts the Brights Zoo in the Spotlight! The Brights Zoo in Limestone, TN, has joined the Academy's collaborative learning environment, with two privately branded custom sites: one for zoo employees and one for volunteers. Welcome! Academy partner CypherWorx has a new tutorial feature on the Academy platform. The learner can click on the tutorial desired in less time than it would have taken previously. A tutorial is a proven, effective method of transferring knowledge and may be used as a part of a learning process. More interactive and specific than a book or a lecture, a tutorial teaches by example and supplies the information to complete a given task. Look for many new tutorials on the Academy platform. We are currently creating a process that will soon allow departments to create relevant training for their staff, using the Do It Yourself (DIY) menu option in My Academy. The process will actually train employees to create their own DIY course. The process will then include routing for approvals, so that training materials can be properly communicated internally before being implemented. While the process is still being finalized, we already have a backlog of departments waiting for the green light. Contact us if you would like more information on the DIY menu, an optional add-on to your site. Looking for ways to minimize the time you spend on volunteer training? Search no more! In your Course Catalog, click on "Education and Interpretation" in the "Browse by Category" section, on the right. You can require volunteers to complete the "Interpretation Basics: Module 1" course before they attend any interpretive training with you. This ensures that they will come to class well prepared with background interpretive information for you to build upon. You'll spend less time on the basics, more time on activities and relevant discussion, and may even be able to reduce the time spent in class. Take a look at the introductory animal courses listed, as well. If your volunteers will be sharing information with guests on any of these animals, require them to review the courses prior to class. These introductory animal courses will give your volunteers a robust background of factual knowledge on animal groups, so the time spent in class can be well spent on your animals, activities, props, and practicing delivery of relevant messages. This also allows you to reach all learners, using a blended approach to training, with the courses available 24/7 for refresher review. That can save you time, along with increasing volunteer aptitude and efficiency. This course is designed to give participants an overview of incipient stage fires and fire extinguishers. The course will identify multiple types of fire extinguishers, as well as their purposes and how to operate and maintain them. Participants will learn the hazards associated with incipient stage fires and tips for when not to fight a fire. The goal is to improve employee safety by educating employees about the risks associated with extinguishing small fires, the importance of early evacuation and fire reporting, and the decision whether to escape or extinguish a fire. An additional goal of this course is to provide information on selection, use, inspection, and maintenance of portable fire extinguishers, to ensure that extinguishers operate safely and reliably. Click here for the July 10th Zoo & Conservation News.